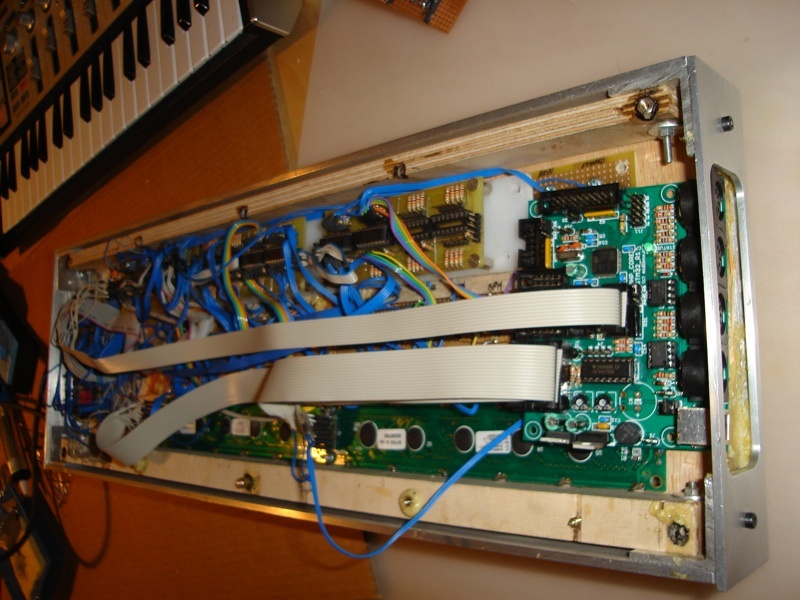 This MIDIbox SEQ V3 has been built by Francois Buat. 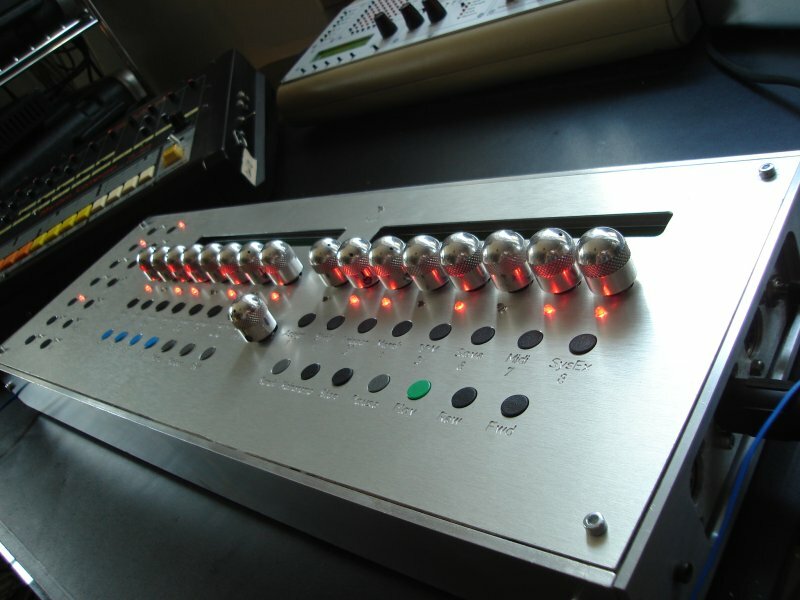 Hey Francois, your sequencer looks really nice, and sturdy, especially with those metal knobs. I believe you made that case especially for ...SEQ? or you find some that fits? Idea for plugs at side panels is great for sequencer if you want to put your synth close to the SEQ. 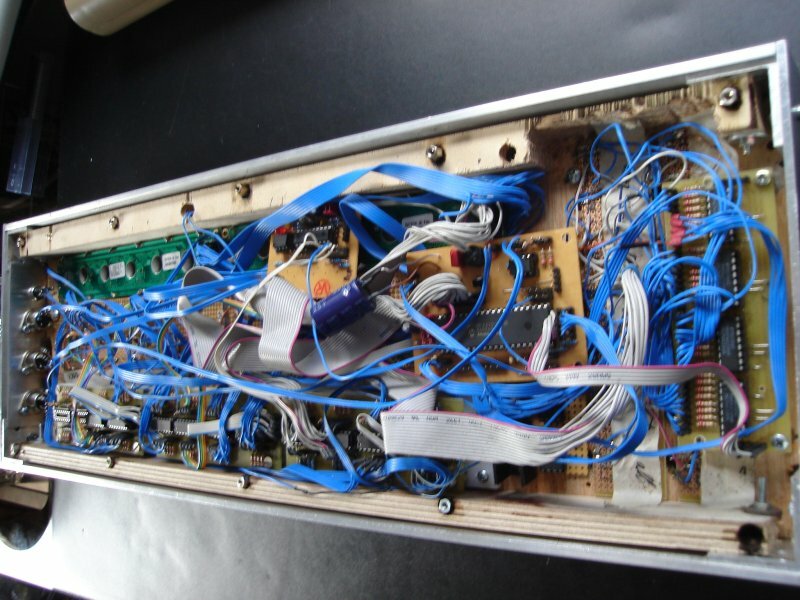 I wanted to do it same way but SEQ V3 have so many connectors to have all at side panels. Once again, great work. VERY cool, where'd you get the knobs? Well, I first thought to use the keyboard of a sun station to fix the front panel on it. Due to that fact, the sequencer is not rackable.. But I don't care as the goal is to get akind of desktop sequencer. It is bigger and in fact, I got a little more place for the electronic. After I noticed that the Sun keyboard is to fin for the electronic, I collected aluminium panels from my company.. :P And did a design for the case which I gave to a friend to machine it. It is true there are many connectors.. At the moment I have 3 midi sockets and 1 power supply. 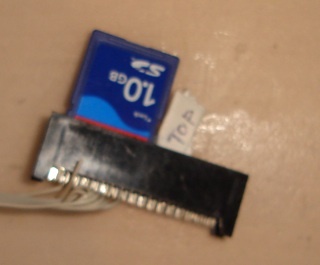 I have to drill other holes and I will use mini din, the same one you can find on video cams. 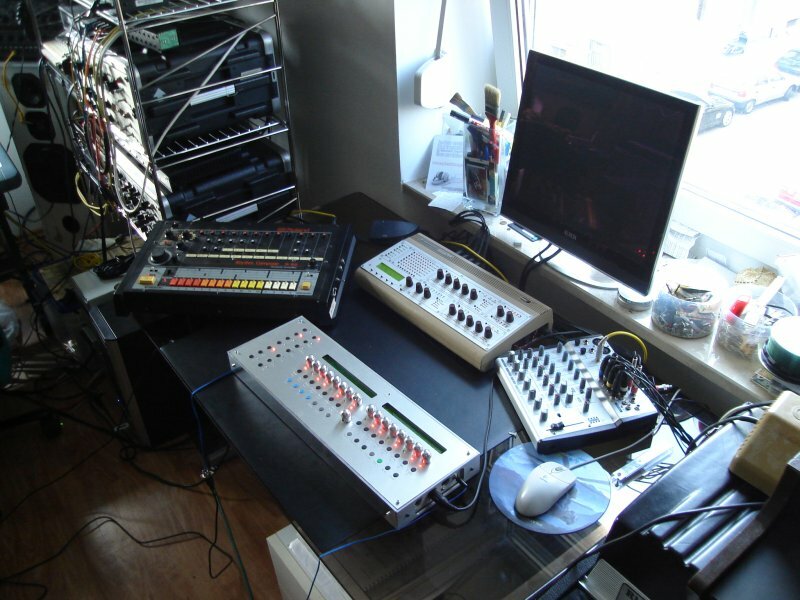 For other additional midi outs and ins as well as for the roland synchro 24. I will add soon machined thick foots with a V shape, just to bring the sequencer a little bit higher with a small angle.. approximately the same you can find on the TR 808 or on the Roland MC4B sequencers. I like this design now.. Funny as during the 80's I hated it.. I wanted to get a very square design, with everything flat, with buttons at the same level than the front panel but with only the rotary knobs doing the contrast. I also wanted to avoid any screw on the front panel. I wanted to install the CV/gate option, but I will do an additional module for it. If not the case would have been thicker and it would have been sade. I have one suggestion... you should paint the engraved letters to be more visible. You wont degrade the look but it will be much better, especially in darker rooms. Some black paint would go very well with rest of the design. No, I want to keep the letters like it is. When you are in front of the sequencer, it is already easy to see the characters. You can distinguish the relief of the letter and I like that. We upgraded this sequencer to MBSEQ V4 today. I had a Deja Vu! Very nice work! Especially with the V4 implementation!